← An apple (cake) a day. It’s official – all of our whining and complaining in Vancouver about the weather has been validated. We are currently having one of the coldest Junes on record. Yeah, yeah, the rest of Canada scoffs at us for moaning and groaning about the (constant, never-ending) rain and laughs when our traffic comes to a complete, messy, accident-peppered standstill when we get an inch of snow. Sure, sometimes we deserve the ridicule. Compared to the crazy weather the rest of the country deals with throughout the rest of the year, we’re pretty pampered with how mild it is most of the time. But seriously – it’s mid-June. And I was wearing my wool winter coat yesterday and was still chilled to the bone. The sun peeked out the other day after I got home from work and in my book, sun = bbq. 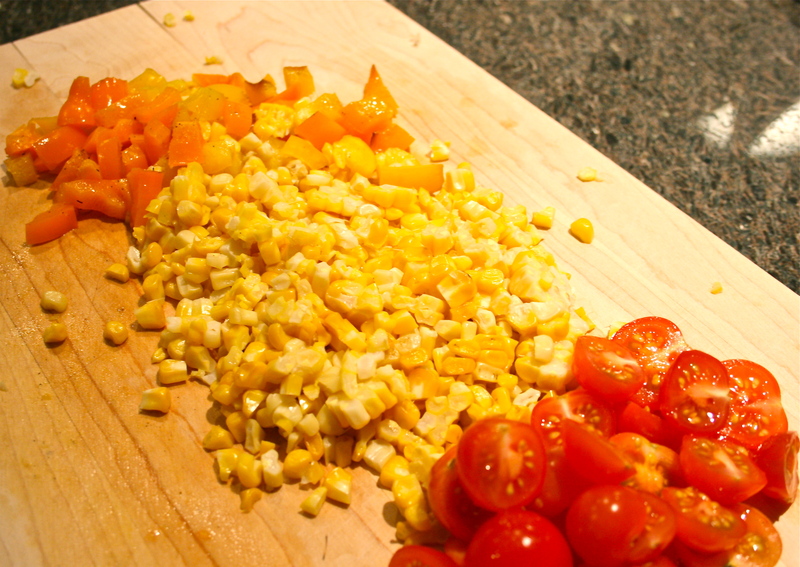 Such an easy, tasty way of getting a healthy meal on the table. We had a filet of wild Atlantic salmon that we lightly dusted with salt, pepper, and drizzled with olive oil, wrapped in tin foil and threw onto our much loved and woefully under-used Weber grill. Ears of corn – check. 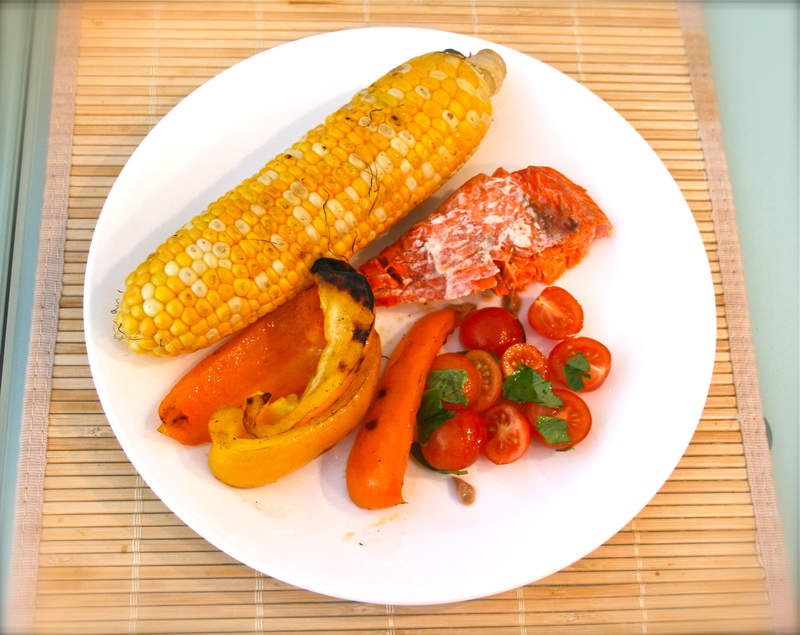 Orange and yellow bell peppers, also simply dressed with salt, pepper and olive oil, was sliced and thrown onto the barbie. Look at those gorgeous colours! I know, I know, salmon should not have that white stuff on it. I’m a Top Chef junkie and on a recent episode, a chef was totally chewed out for leaving it on their salmon. It’s unsightly and is usually a sign that the fish is overcooked. Oh well – I scarfed it down and it was still delicious! The fish flaked but was still super moist inside. I love the taste of salmon on its own so we don’t usually cook it with anything more than salt and pepper. The best part about cooking with lots of food is having plenty of leftovers for lunch. If I didn’t pack it up the night before, we’d be going to work empty handed and forced to spend the money and excess calories on take-out. 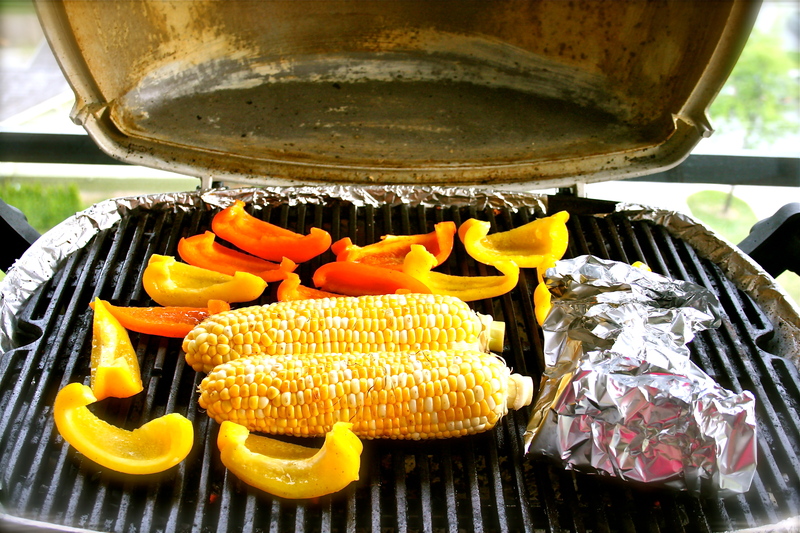 So what am I going to do with leftover grilled corn and peppers? I only very recently tried quinoa for the first time and I love it. Lawyer Girl at my office has it for lunch on a regular basis. She’s not a vegetarian but she’s very conscious of what she puts into her body and doesn’t usually eat meat, eschewing it for tofu and all kinds of grains and beans. 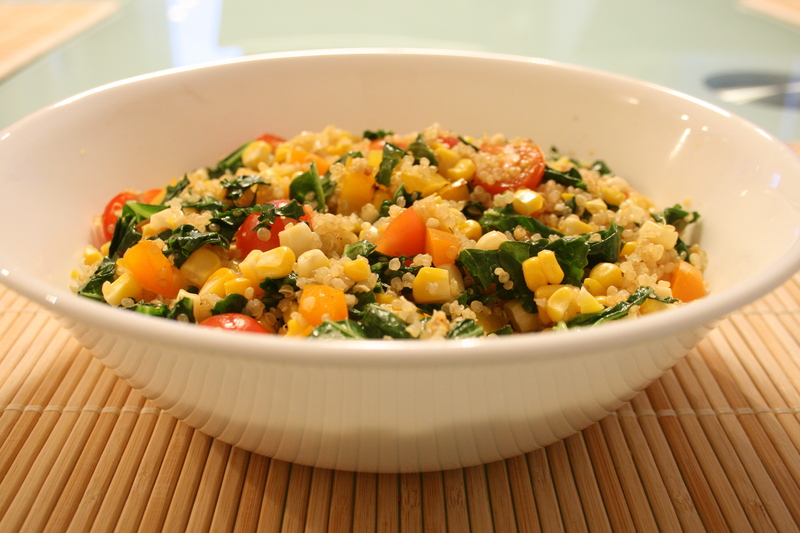 She often has super healthy meals made with organic and local ingredients when she can get them. I make fun of your hippy, granola ways, Lawyer Girl, but I secretly admire you for the discipline to eat the way you do. I’ll think of you whenever I eat quinoa. Seriously, it’s delicious and so easy to cook. The Baby Sis bought a bag of organic quinoa from Whole Foods two years ago and had never opened the package. Despite my usual fear of eating foods past due dates, I eagerly volunteered to try it since I was getting it for free. After consulting with the bringer of all knowledge (Google), and reading that quinoa is ok to eat some two years after its been purchased, I forged ahead. I didn’t make too much of it – I rinsed half a cup of quinoa and poured it into a small saucepan with one cup vegetable broth. I simmered it for about 20 minutes, until all the water was absorbed and the texture was to my liking. 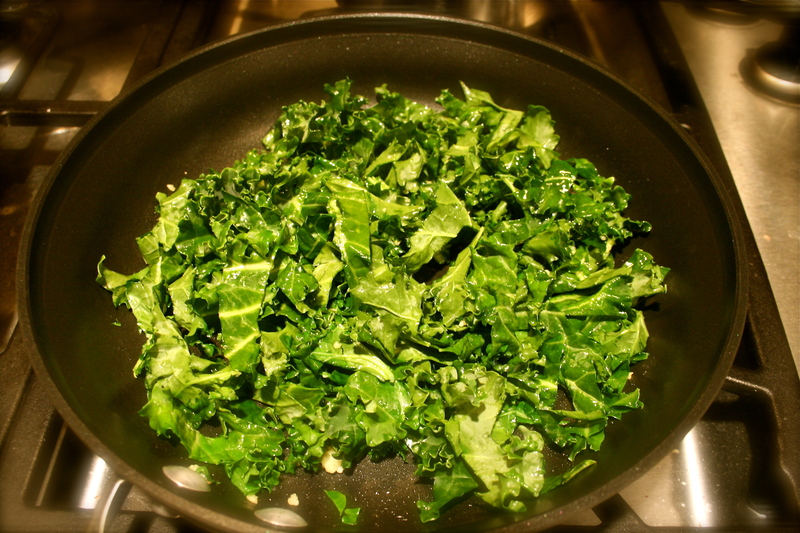 I had local kale from the farmer’s market in the fridge and decided to throw that in as well. I cut it into strips and sautéed it with lots of garlic and olive oil. Just dump everything into a bowl and mix. No extra salt or pepper needed. 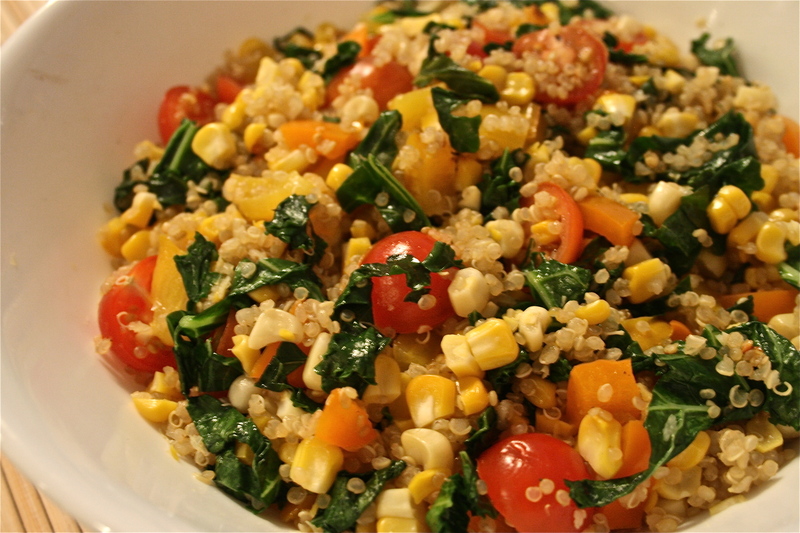 Voila – a beautiful, vibrant, fresh, tasty quinoa salad with kale, corn, bell peppers, and cherry tomatoes. It was two days worth of lunches for the Husband and I.
That’s summer in a bowl, people. yummm that looks like a delicious meal! love that you added kale. if you want to buy more quinoa, costco sells it for a decent price. Thanks for the tip re: Costco. I definitely need to replenish my quinoa supply soon. Ha! A post that pays homage to you is obviously the best one! 😉 The salad tasted as good as it looked. Thanks for inspiring me to finally try this delicious magical pseudocereal (as it’s called on Wikipedia).